As we work on refining the concept of 'Crescer com Arte' we are visiting with community leaders and people in the cultural sector in Rio de Janeiro. One person with many years of experience in designing and producing sociocultural projects is Fernando Portella, president of the Instituto Cultural Cidade Viva and director of the company Engenharia Cultural. Large Corporate clients hire the Instituto Cultural Cidade Viva to realize social and cultural projects to the benefit of the community. Examples of past projects are the improvement of the library system in small cities and an inventory of small coffee farms, documenting rural architecture and the history of coffee production towards cultural tourism in rural areas. In our meeting with Fernando in the outdoor patio conference room of the well-appointed offices of Cidade Viva, he told us about a large project that he is developing for the recently pacified favela Complexo do Alemao. He is interested in having 'Crescer com Arte' involved in it. 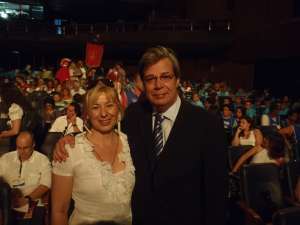 He then invited us to the 2nd Edition of the Rio Socio Cultural Prize held at the Joao Caetano Theatre in downtown Rio. This is one of the most important prizes in recognition of sociocultural actions. One of the effects of the prize is to consolidate the identity of the 'povo fluminense' (people of the state of Rio de Janeiro). Conceived and produced by Instituto Cultural and Riosolidario with the support of the Secretary of Culture of Rio de Janeiro and Corporate sponsors and in the two years of it's existence it has involved a total of 438 actions representing 80 municipalities. On April 14 at Joao Caetano theatre we saw short films about the top ten projects. A jury chose five to be recognized with a prize of $10,000. reais each.